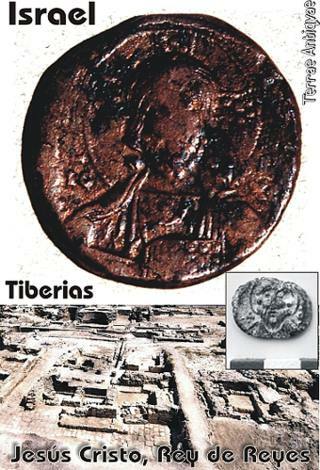 Fotos: (1) One of the "Jesus coins" found this year in the excavations of ancient Tiberias on the Sea of Galilee. The coin was minted in Constantinople in the 11th century and was probably brought to Tiberias by a Christian pilgrim. The obverse side (shown) bears the likeness of Jesus, and the other an inscription reading "Jesus Christ King of Kings." (2) Excavations at ancient Tiberias, showing the Galilee Street, and the basilica complex, with the Sea of Galilee in the background. Un raro sello del siglo VI en el que aparece la imagen de Jesús por un lado, y el símbolo de la cruz con un símbolo de la palabra Cristo por el otro, encontrado en Tiberias, Israel, es probablemente la imagen de Jesús más antigua que se conozca. Científicos de la Universidad Hebrea de Jerusalén aseguran que, dado que no existen manifestaciones pictóricas previas a la elaboración de este sello o moneda, se trata de un objeto realizado a través de memoria histórica de los caracteres, por un artista cristiano. Yizhar Hirschfield, arqueólogo de la Universidad Hebrea, explica que no pudo haber sido influido por obras clásicas, ya que, figuras de Jesús y de las diferentes advocaciones de la virgen María y el niño Jesús son posteriores en al menos un siglo. De 0.79 pulgadas, el sello es de las dimensiones de una moneda, y tales objetos eran usados para documentos oficiales del Imperio Bizantino. En una cara del sello se observa una persona silueteada, con el hombro derecho bajo una cruz, y un halo sobre su cabeza. El símbolo de Cristo del reverso consiste en una cruz con brazos iguales. La porción vertical de la cruz forma una F, que significa el monograma de Chi Ro, que en griego significa Cristo. Further revelations of the beauty of the ancient city of Tiberias and of its uniqueness as a Jewish center were revealed in this season's excavations there. The excavations, funded by the Tiberias municipality, are turning the site into a significant archaeological park, according to dig director Prof. Yizhar Hirschfeld of the Hebrew University of Jerusalem and the Israel Antiquities Authority, and Prof. Katharina Galor of Brown University, Providence, RI. Ancient Tiberias' location, just south of the modern city of Tiberias along route 90, was highly attractive in Roman times: on one side open to the Sea of Galilee (Lake Kinneret) and on the other bounded by Mount Berenice. Two main north-south streets dominated the city plan. One was the cardo, the main commercial thoroughfare of the town. The other was the promenade, which was open on one side to the lake and over which route 90 was built. Excavations this year focused on the city's basilica complex, which was first discovered several years ago and is identified with the seat of the Sanhedrin, the ancient supreme Jewish religious authority. The eastern wall of the structure was preserved to a height of two meters and was bounded by the promenade. Beneath the apse hall, remains of an impressive, first-century, marble floor were found. There is no natural marble in Israel, and therefore, this floor must have been part of a grand structure belonging to an individual of extraordinary wealth. The excavators believe it was one of the palaces belonging to Herod Antipas, son of Herod the Great, who founded Tiberias in 20 C.E. A marble floor of this type from the Second Temple period has been found previously in Israel only at the Herodian palaces of Masada, Jericho, and Herodion. The finds in the remains of the complex's ancient shops this season were extremely rich: complete oil lamps, bronze coins, including more of the "Jesus coins" (a coin from the 11th century bearing the image of Jesus, discovered in earlier excavations there), glass and stone vessels, jewelry and frescoes. On the western façade of the basilica complex, a row of shops was discovered along with a 50-meter section of street paved with basalt stones, which the archaeological team named "Galilee Street."